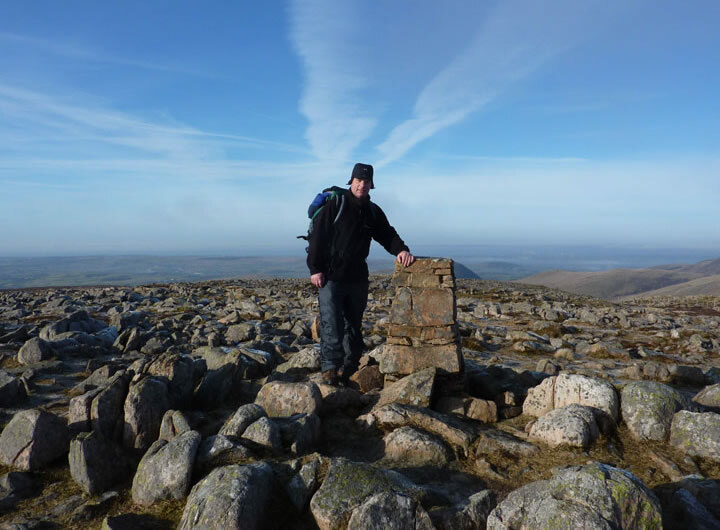 This walk was postponed six weeks ago due to poor road conditions. 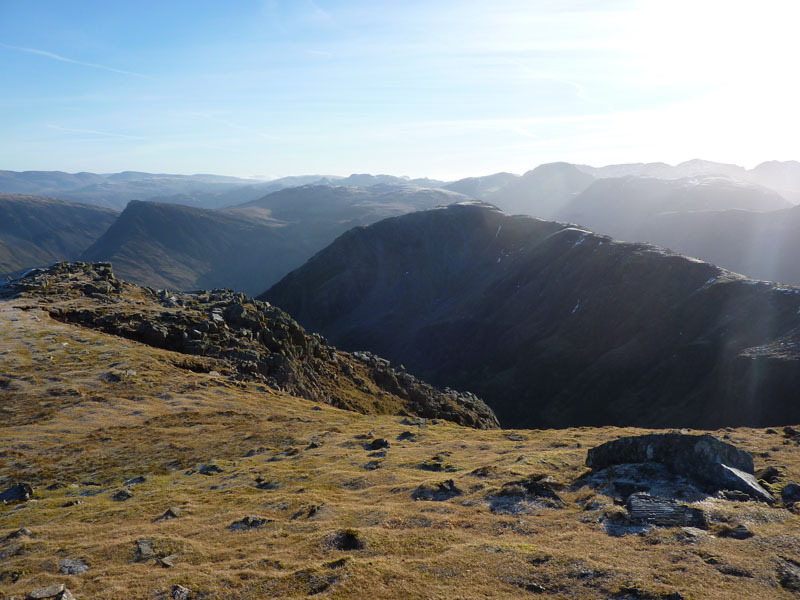 The Western parts of Lakeland are at the limit of the distance I am prepared to travel for a day's walk, so the weather has to good! 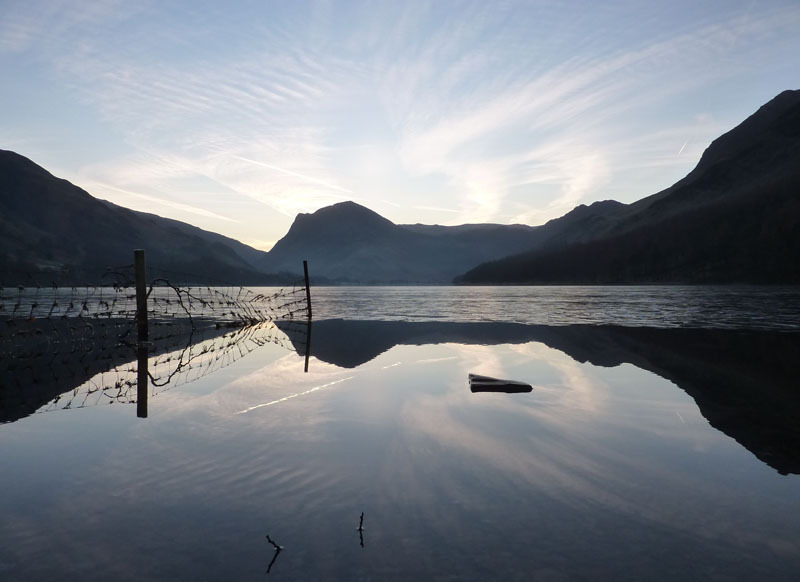 I left home at 05:45 and arrived in Buttermere at 08:00. 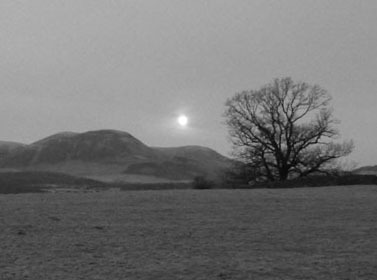 Forecasters had indicated either clear skies or maybe valley mists with mountain tops above the mist, either would do. 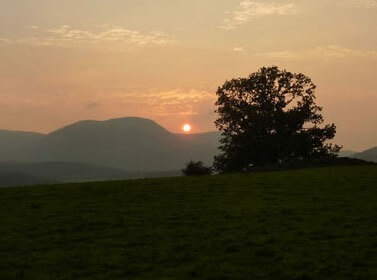 Just before arriving in Buttermere, I stopped to take a photo of the descending moon and remembered that I stood here and took a photo of the sunset, last September. 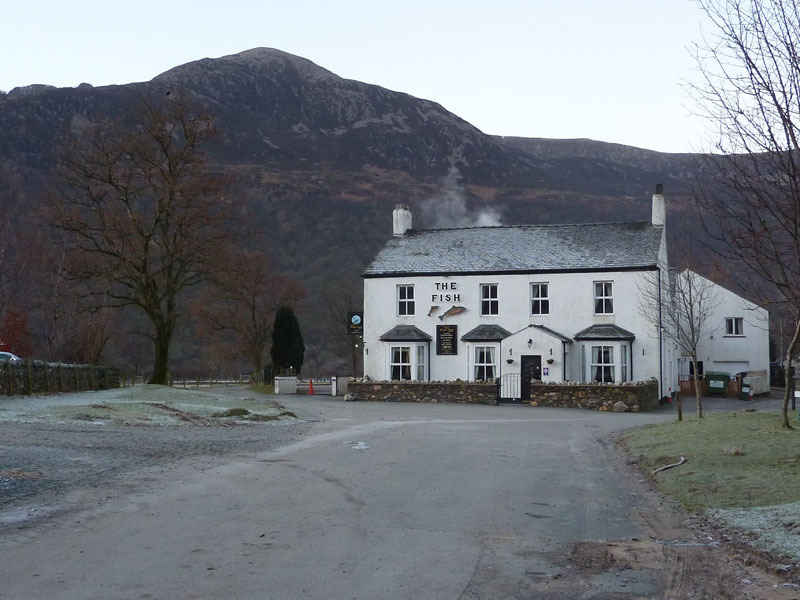 Buttermere was quiet, both hotels closed, nobody about. Just how far would I get today without meeting anyone? 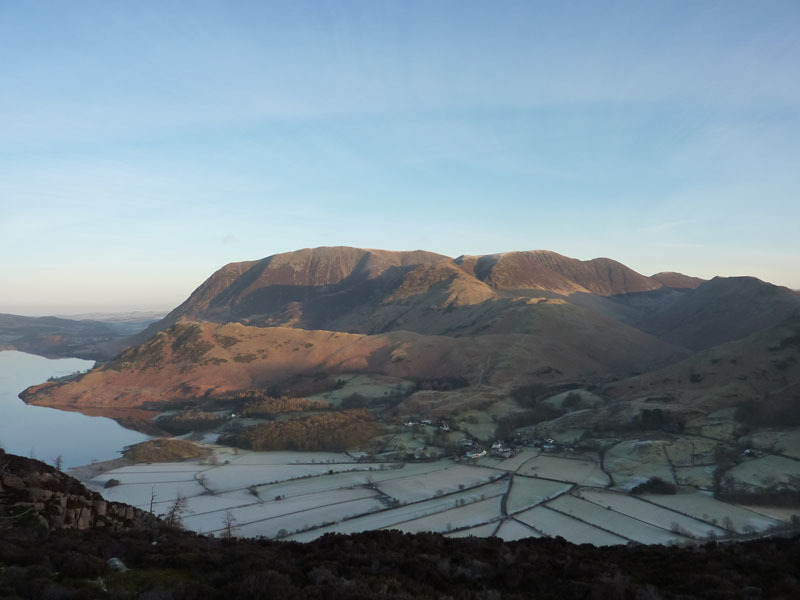 Buttermere doesn't see too much of the sun in deepest winter, the High Stile ridge being the guilty party. My route went through Burtness Wood. 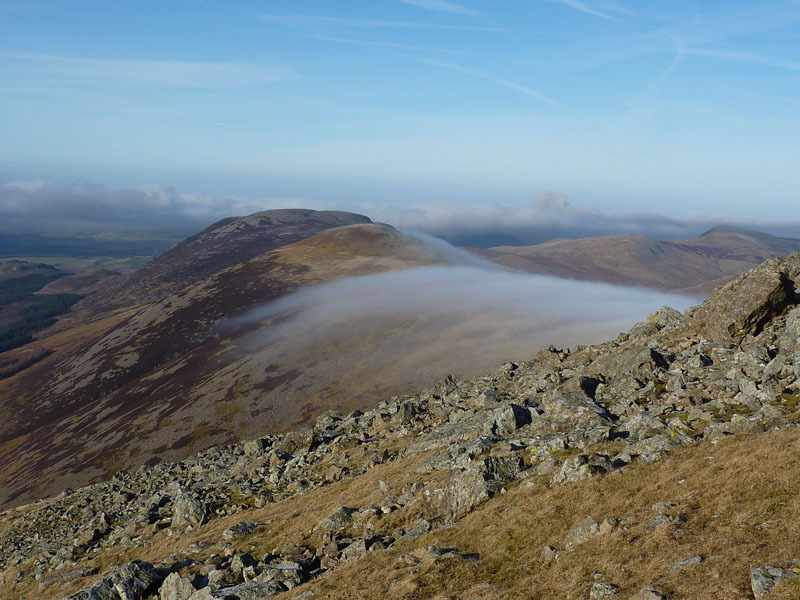 The weather is good, no valley mists here. 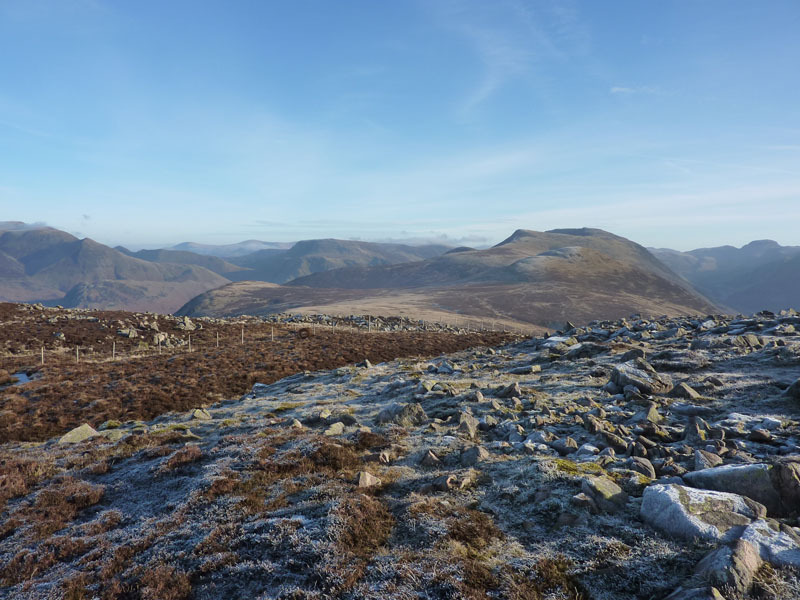 I recall a gruelling climb on this route when I was much, much younger. A few things are different: I was a slightly grumpy and maybe unwilling teenager (maybe still slightly grumpy, occasionally); it was a hot summer's day & the path was un-repaired. 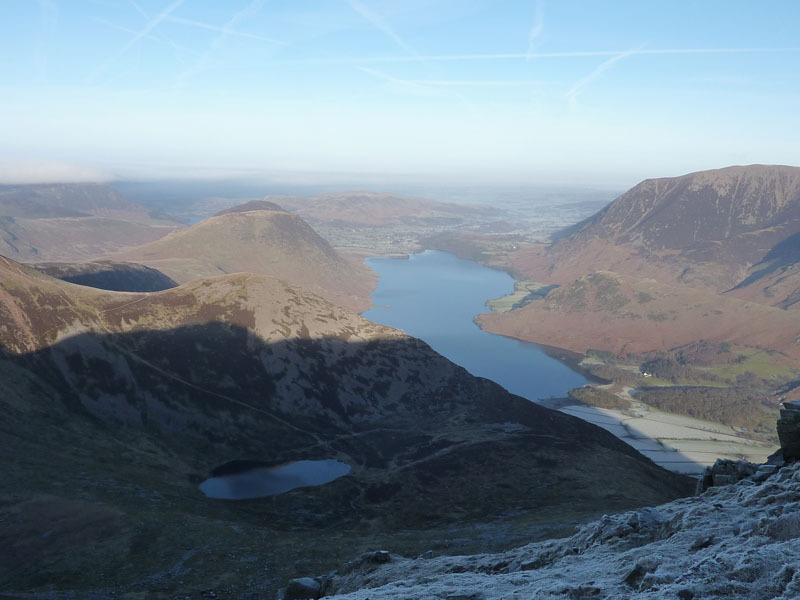 This is a really fine mountain ascent, outstanding views of Buttermere, Crummock Water and the North-Western Fells. 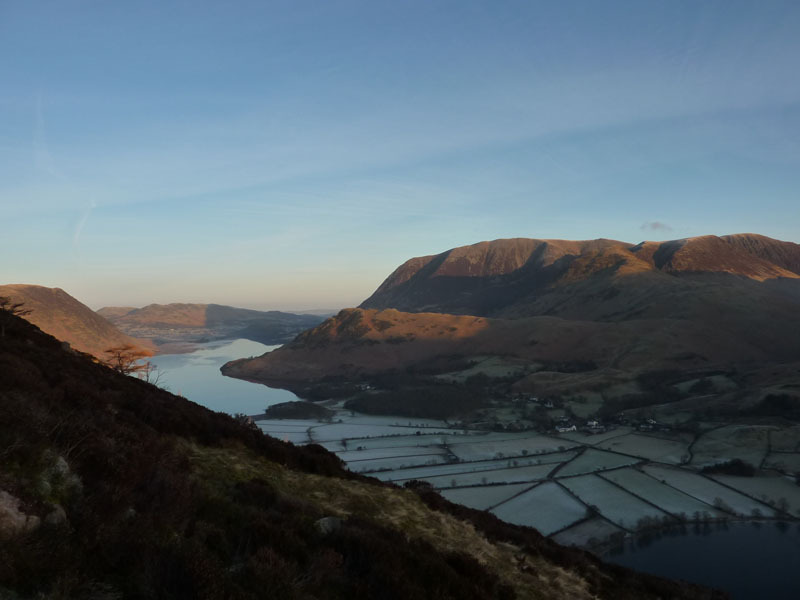 The lower fell with the sunlight upon it is Rannerdale Knotts. 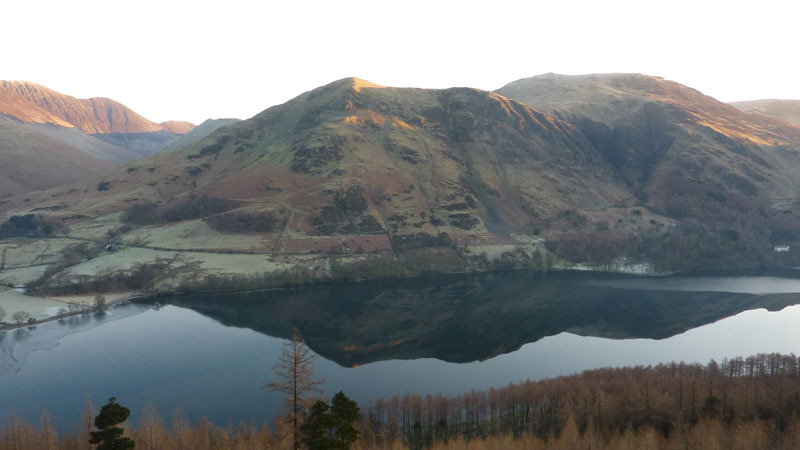 According to clever people, Buttermere and Crummock Water, together, were once one lake. 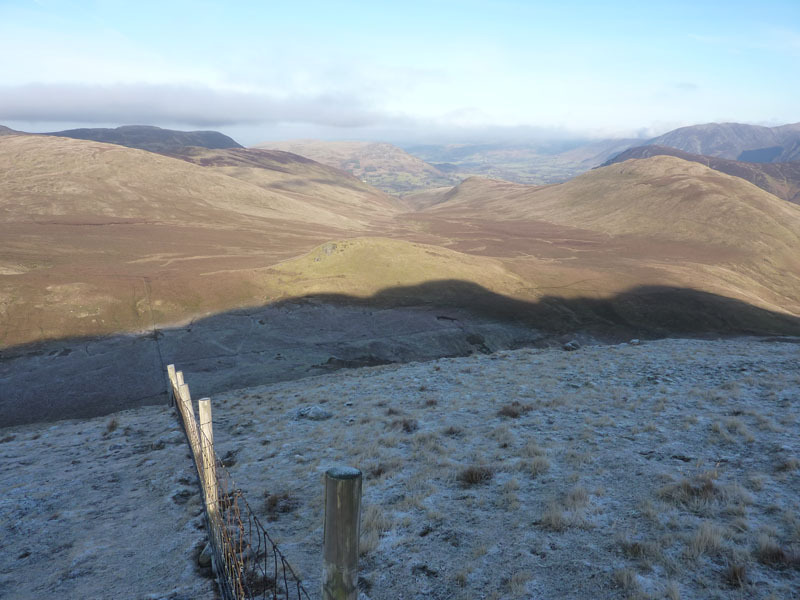 The "fan delta" created by the alluvium washed down from the fells (Mill Beck) now separates the lakes. Look how the walled fields mimic the shape of the fan. 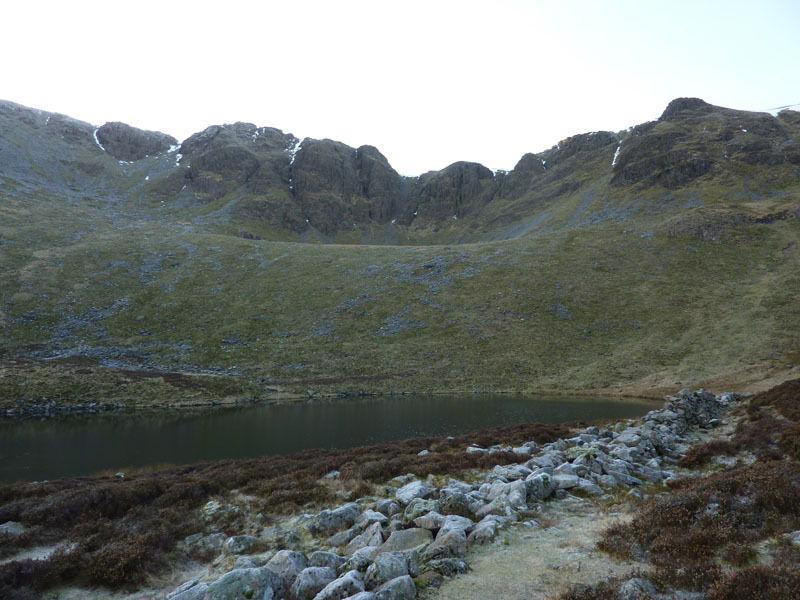 Bleaberry Tarn welcomes the walker at the 1600ft contour. 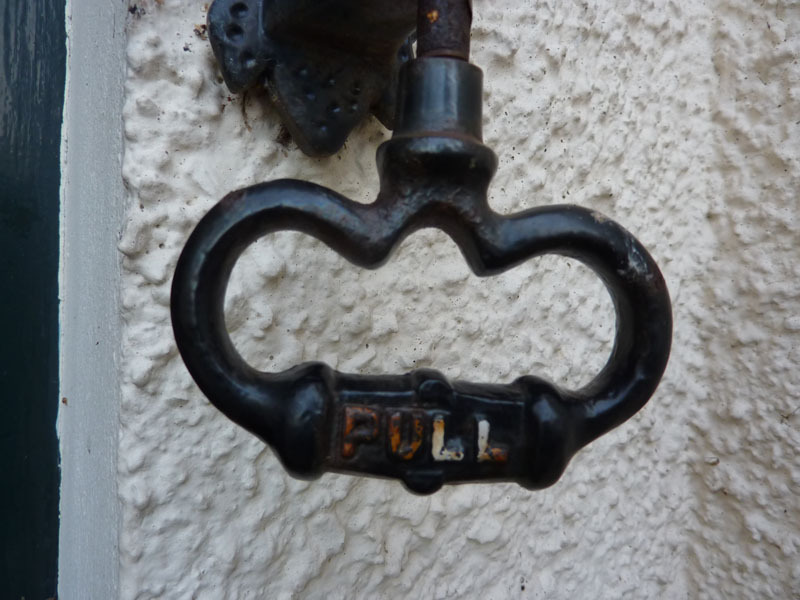 This is an unusual corrie, with a double-dip of depressions. 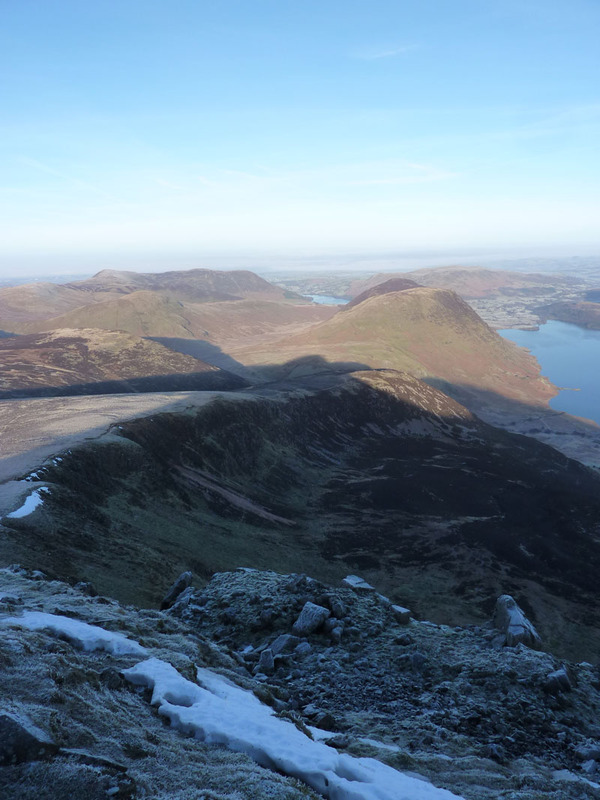 Dodd offers great views of Crummock Water and a good prospect of Red Pike. 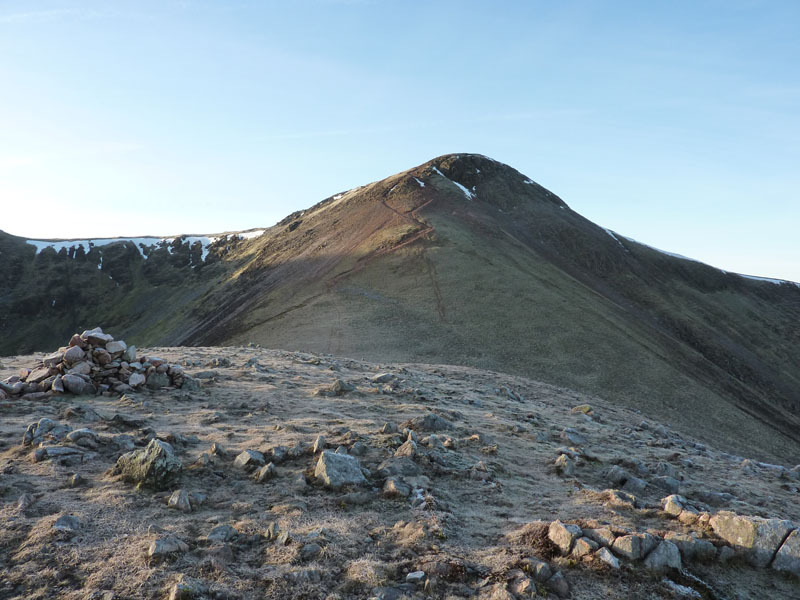 My intention is to head off to High Stile (behind me), but after that I'm aiming for Starling Dodd and Great Borne and maybe Hen Comb. I won't annotate the photo, get your maps out. 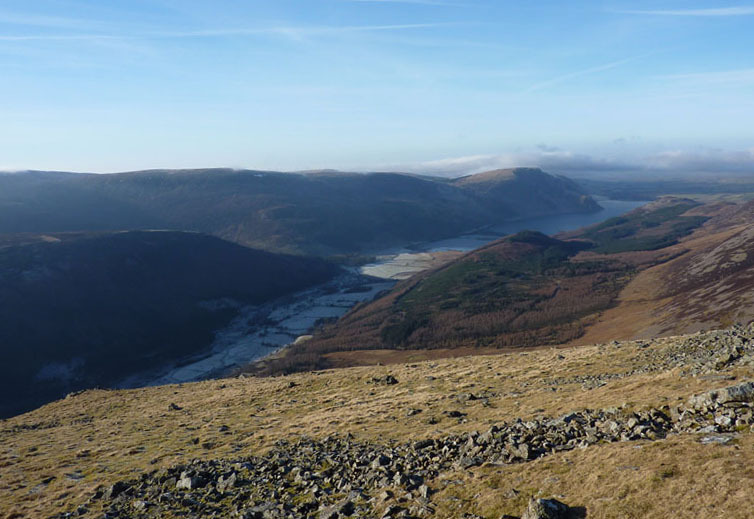 Ennerdale Lake is in view. 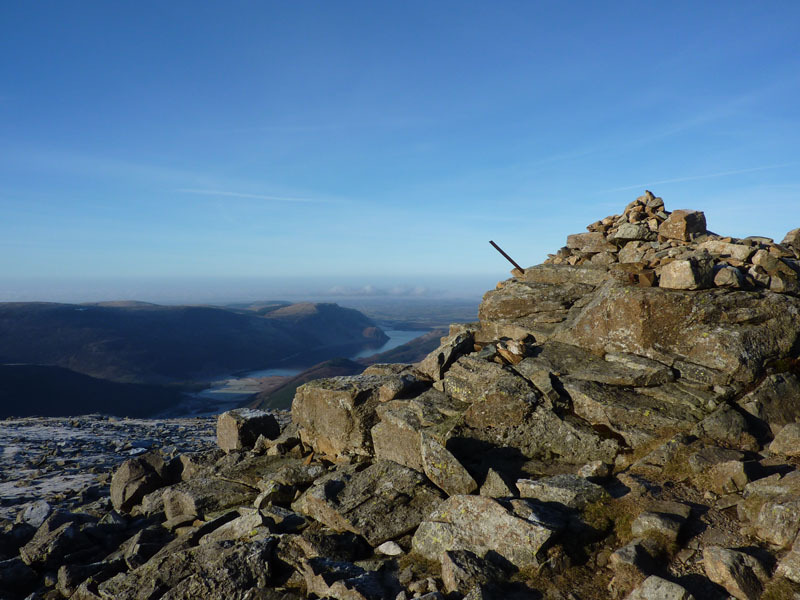 The summit area of High Stile is a great place to be, big views all around. If it wasn't for the boulders and stones that abound, you could have a small game of cricket. Whilst I'd been eating a sandwhich and looking elsewhere, clouds have been advancing from the sea, that could make it interesting. Starling Dodd is just visible, Great Borne is disappearing. 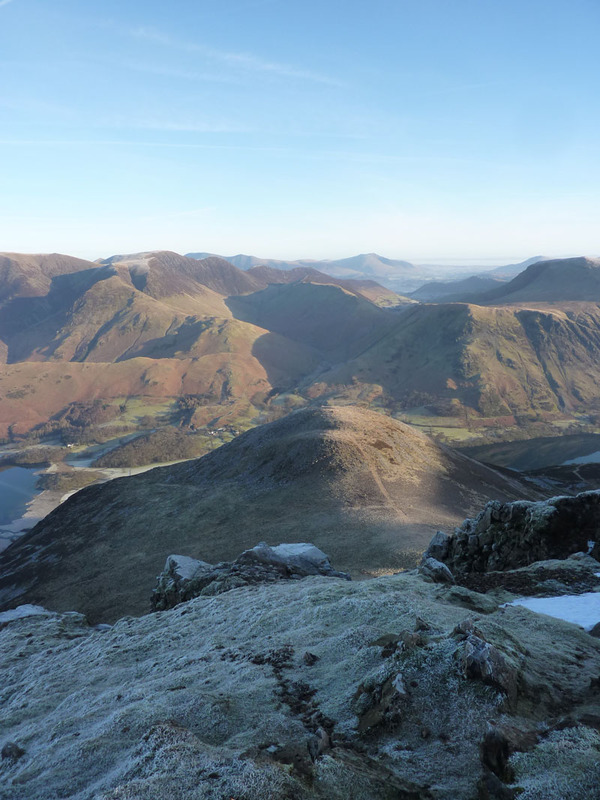 Red Pike on the right, put the maps away. 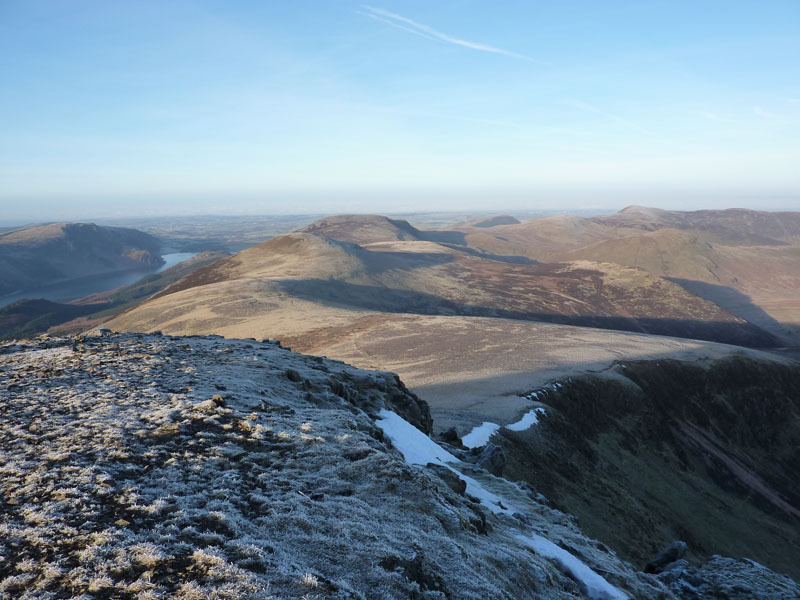 Thirteen minutes later than the first photo of the clouds, the situation is quite different, Great Borne now clear and Starling Dodd becomming so, I'm on the southern flank of Red Pike (White Pike). 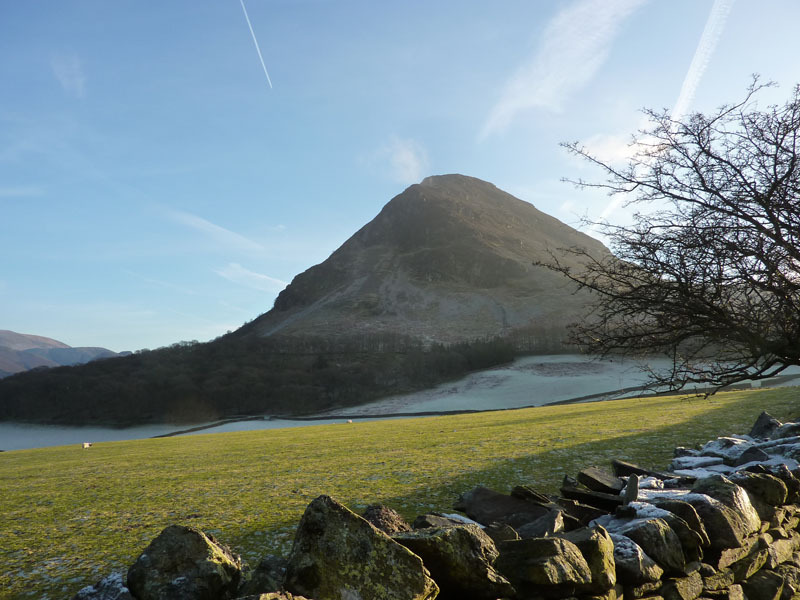 Crag Fell is the fell at the far end of the lake, the wooded knoll at this end is known as Latterbarrow (there's a few of those dotted about). Acceptable littering? This iconic structure is also ironic, is this rubbish or art? 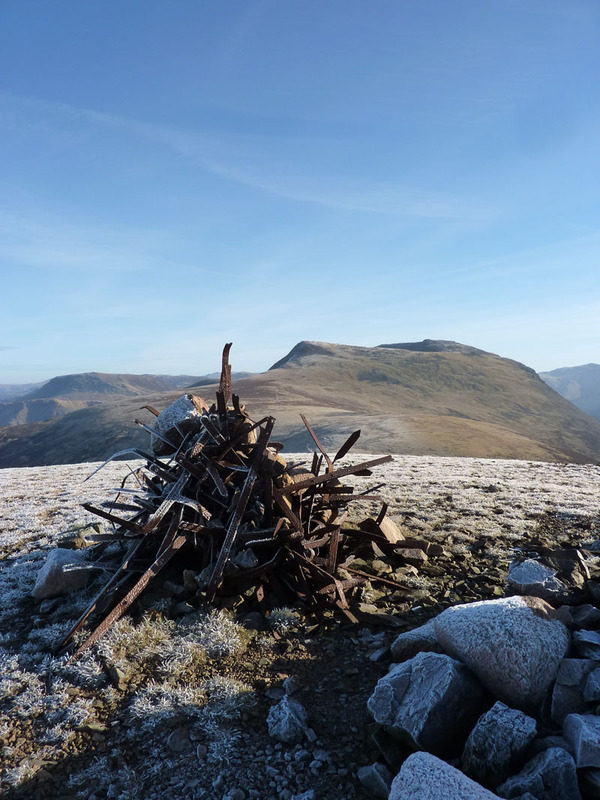 Known as being Wainwright's final fell in his series of guidebooks, this lot was there way back in September 1965. My first time here. Imagine my surprise when I found another walker at this point, four and a half hours into the walk. Handy, though, he took this photo of me. 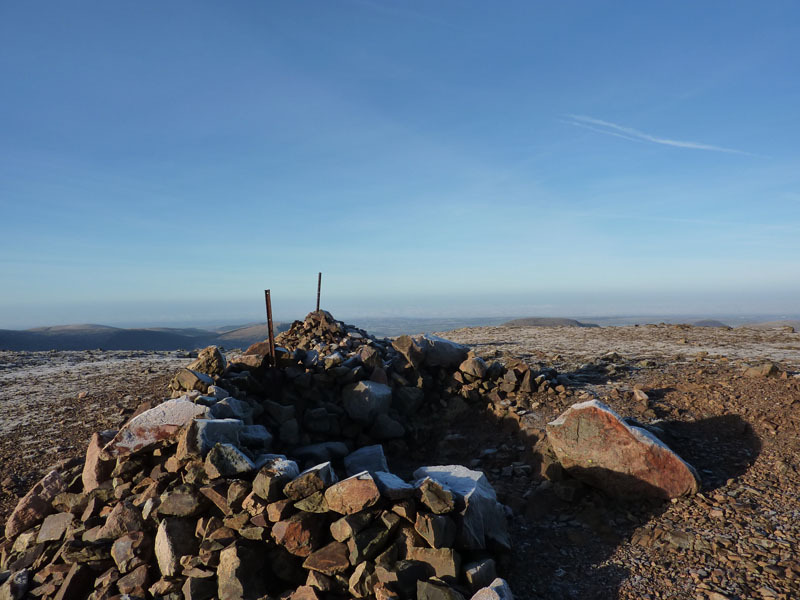 This is the 200th Wainwright Summit in my ongoing project to visit all the tops he featured in his Pictorial Guides. This reminded me of being at the top of a rollercoaster. I clung to the fence for support as the ground was frozen. Floutern Cop is that little bump in the centre, Hen Comb is to the right. 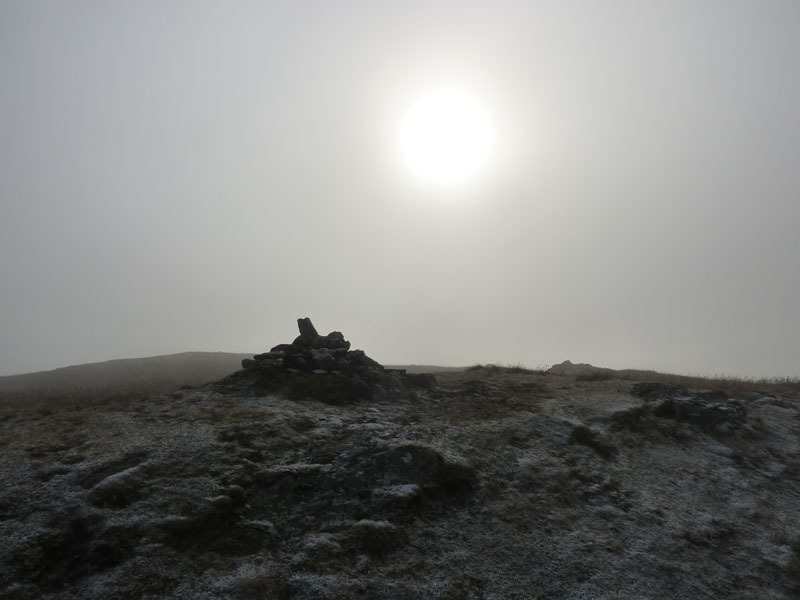 I went up Hen Comb to enjoy the views and was caught in the next batch of summit-clouds. 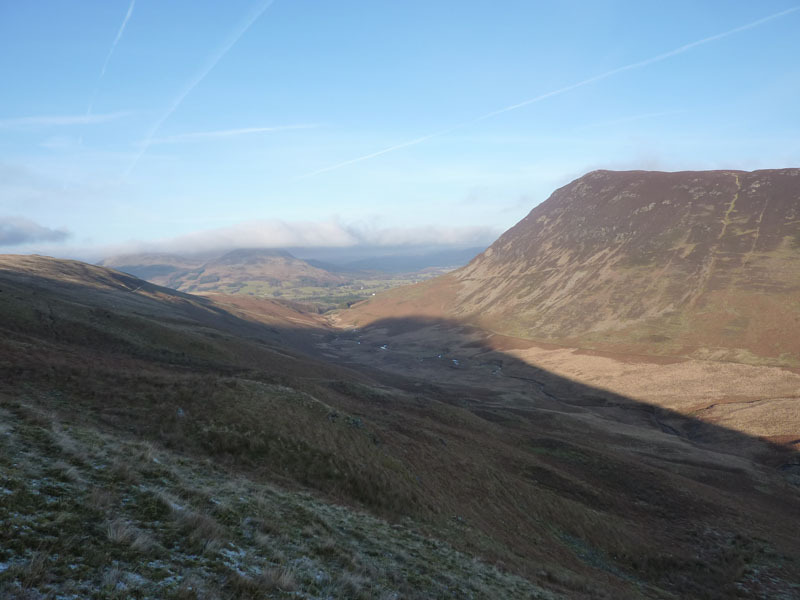 I then went straight down the flank into Mosedale (there's a few of these in Lakeland). 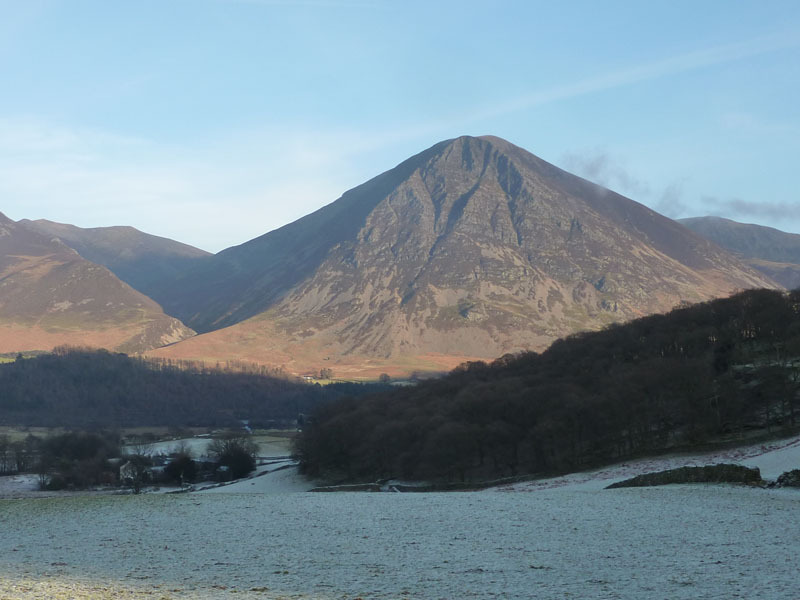 Fleetwith Pike is well displayed from here, cloud on Starling Dodd (right). 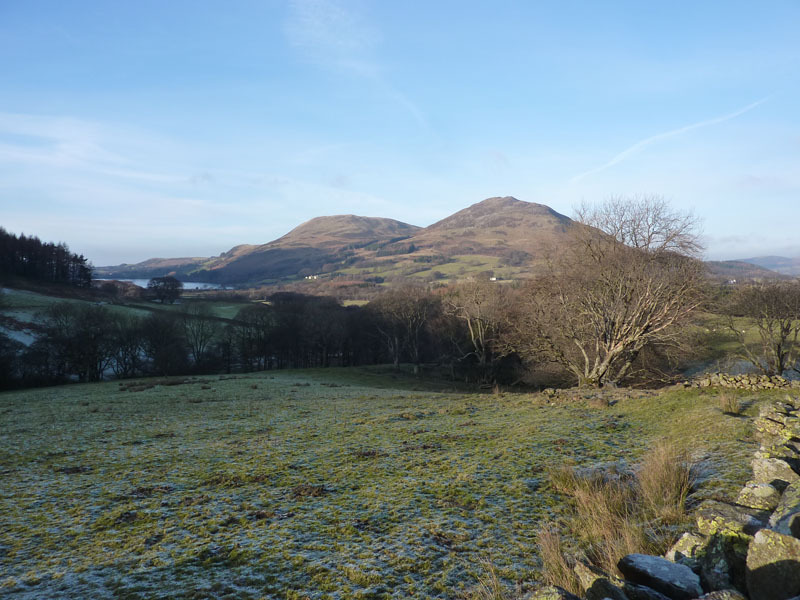 I met Roger and Ann Hiley at "Harry's Pool" and walked with them into Loweswater. 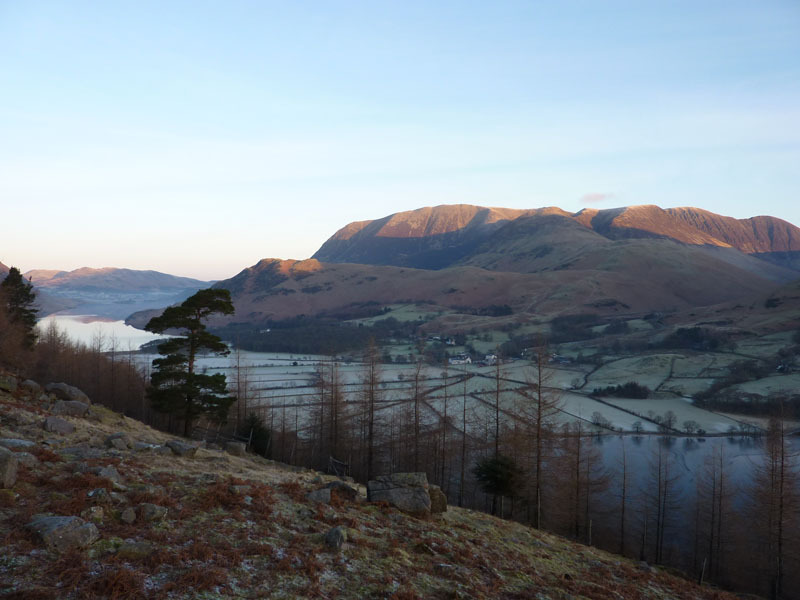 Just a few more camera clicks on the way to Oak Cottage. Time taken: 6hrs 45mins over a distance of approx. 11 miles. 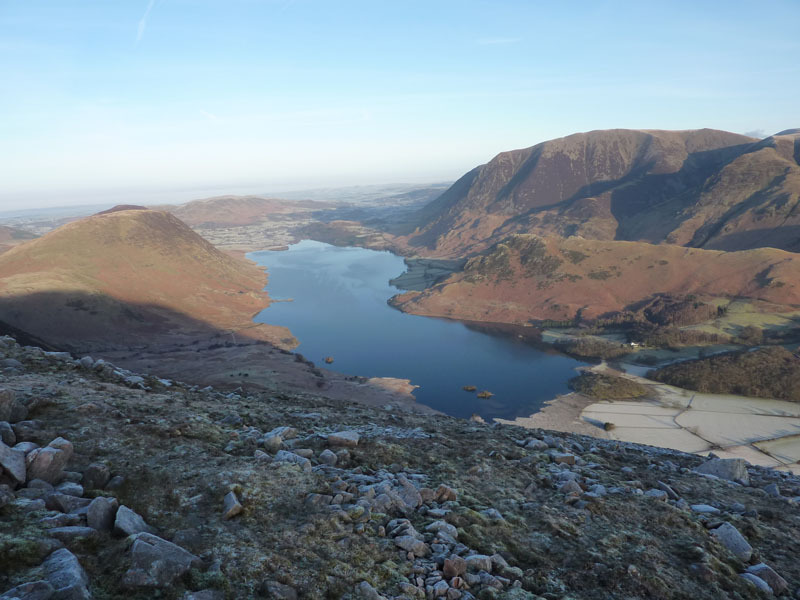 Route: Buttermere, Bleaberry Tarn, Dodd, Red Pike, High Stile, White Pike, Little Dodd, Starling Dodd, Great Borne, Floutern Cop (not the top), Hen Comb, Mosedale, Loweswater. 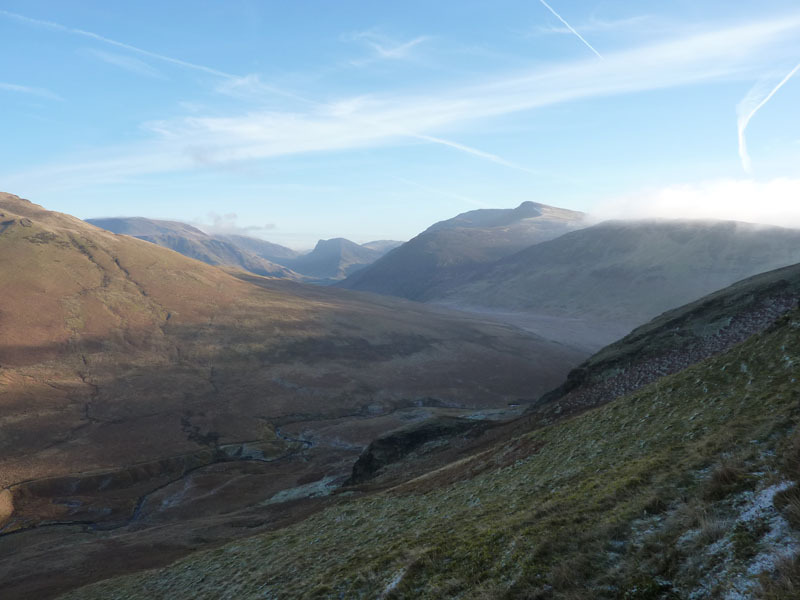 Ann kindly gave me a lift back to Buttermere. Weather and conditions: Clear Skies! 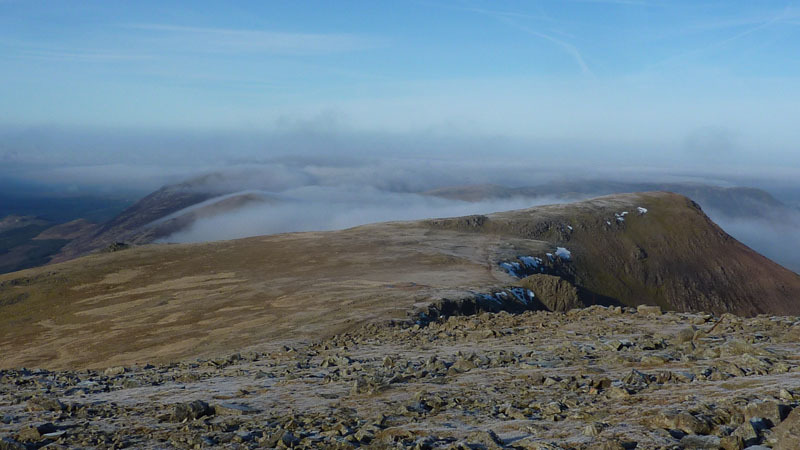 Occasional threats of mountain clouds, misty top on Hen Comb. 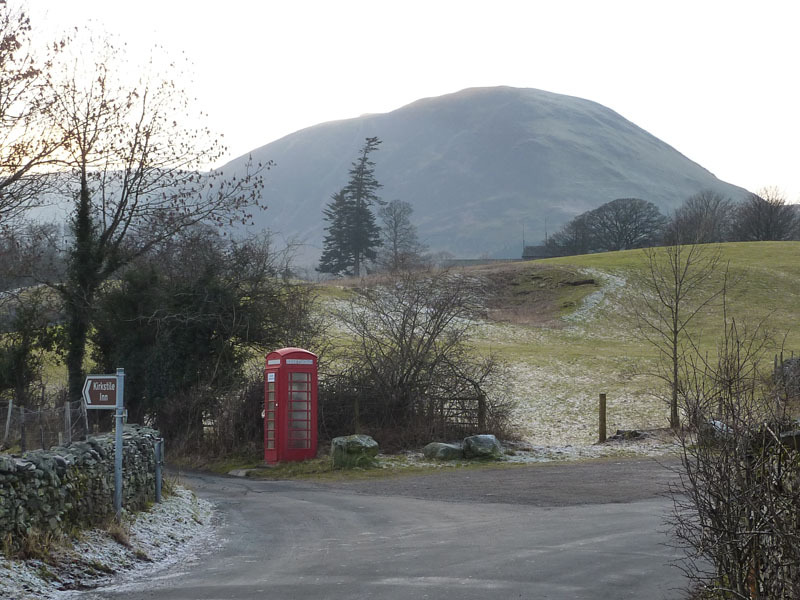 Richard's Refreshment Review: Tea and cheese scones at Oak Cottage, Loweswater. The proprietors are friendly and welcoming. Tea was served from the pot, enough water for a second cup - which I always appreciate. Service was prompt and the cheese scones were very tasty. I should make the point that Roger and Ann are friends of mine through the Online Fellwalking Club and this is not a commercial enterprise! 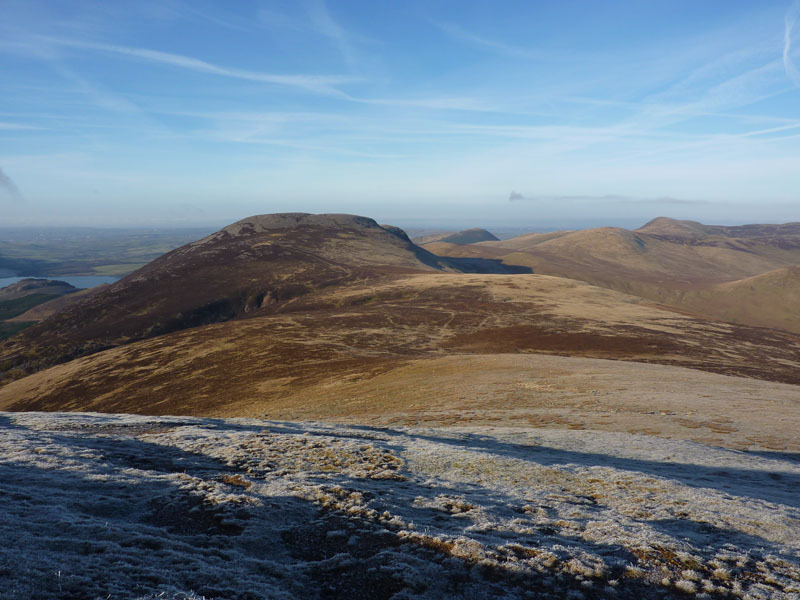 Since I first placed this page on t'internet, I've found that David Hall was not far away and he saw the clouds on Great Borne - note however that he is looking at the second batch of clouds, not the first ones that I saw from Red Pike. Click the link and take a look, if time allows.